An attractive mix of organic long grain brown rice and black wild rice which is very easy and quick to prepare. These versatile grains are conveniently packed in a microwaveable pouch for maximum freshness and flavour. Seasoned with award winning, double strength tamari soya sauce, these delicious grains can be eaten hot or cold. Enjoy on their own, in stir-fries and salads or as a nutritious and colourful side dish. Water, long grain brown rice* (34%), wild rice* (6%), tamari soya sauce* (2.5%) (soya beans*, water, sea salt, mirin* [sweet rice*, water, cultured rice*]), extra virgin olive oil*, sea salt. Microwave: 1. Remove pouch from the cardboard sleeve. 2 Make a small tear in top of the pouch. 3. Heat on full power for 90 seconds (time may vary depending on microwave). 4. Open pouch, squeeze the grains onto a plate and fluff with a fork. Take care when handling the pouch as the contents will be hot! On the hob: Remove pouch from the cardboard sleeve. 2. Open pouch and squeeze the grains into a non-stick pan. 3. Add 2 tbsp. of water. 4. Heat gently for 2-3 minutes stirring occasionally. Can be eaten cold straight out of the pack. 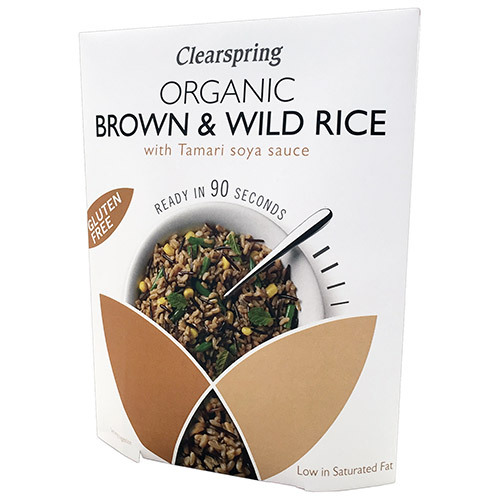 Below are reviews of Clearspring Organic Brown & Wild Rice with Tamari Soya Sauce - 250g by bodykind customers. If you have tried this product we'd love to hear what you think so please leave a review.